Generally speaking (unless your roof is flat), the pitch of the roof on your home is going to be the angle that your solar panels are mounted at. In Australia, common roof pitches are 15 degrees or 22.5 degrees from horizontal, so your panels will most likely be mounted at one of those angles. If you have a standard roof at one of those angles then that is the angle your panels will be installed at. It is simply not worth the expense to engineer a framing system that will adjust the angle of the panels by a few degrees for almost no increase in energy yield. If this is you, you can skip to the section on shade. However, if you have a flat roof – or you’re designing a house from scratch – read on. If your roof is totally flat, I strongly recommend mounting the solar panels at an angle of at least 10 degrees. This is really important because it will allow any rain to run off the panels. If the rainwater pools on the surface of a flat solar panel, it is more likely to eventually get through the panels’ seals and into the solar cells themselves. If this happens, it’s game over for the panel. You’ll get an earth fault and you’ll need to replace the panel. Many panels have a warranty condition that they must be mounted at least 10 degrees from horizontal. Don’t listen to anyone who tells you to have the panels horizontal and just add a panel or two to make up for lost efficiency. Horizontal panels are asking for trouble down the line. They’ll also get a lot dirtier because they’ll have little ability to self-clean in the rain, so you’ll need to clean them manually more often. For these reasons, if you have a flat roof, most good installers will add the cost of a ‘tilt frame’ to their quote. If you do have to have flat panels then use good frameless ones, as that will help any water flow off them and reduce the amount of grime that builds up. Frameless solar panels are more expensive, though, and they need to be really well sealed at the edges. Online resource: If you’re mounting your panels on a frame or you’re lucky enough to be designing your own solar home, then your choice of angle is less limited. So what angle should you choose? This is a big one. Nothing destroys the efficiency of a solar panel system like shade – not roof pitch, not roof direction, not clouds. When it comes to solar power, shade is your enemy. If your roof is mostly in the shade from 10am to 3pm, and you’re not willing or it’s not possible to remove the trees or other objects casting shadows, I’m afraid you’re out of luck. And if an installer tells you any different, you, my friend, are in the presence of a cowboy – a con artist, a dodgy installer, the Lord Mayor of Shonkytown. But what if you have shade that is not ‘substantial’? You will need to find an installer with a device that quantifies shade. My favourite one is called a ‘SunEye’. These shoebox-sized devices can be plonked on your roof and, within a few seconds, they’ll take a 360-degree photo capturing anything that may cast a shadow on your roof. But that’s not all! They then use their GPS to work out where you are on the globe, and calculate how much shade your roof will be in every hour of the year based on the sun’s position above your roof over time. Pretty smart, huh? The result is a percentage that tells you how much the shade will affect your solar production, where 0% means there is no effect, and 100% means there is zero power (for people who live in caves). Once you have that number to rely on, you can decide if the solar panels will generate enough power to be worth buying. I simply don’t understand how anyone can quote on a system for a shaded roof without the numbers from a SunEye or equivalent device. How can you possibly be expected to make a decision based on a wild-assed guess from an installer or salesperson without the necessary gear? If you have shade on your roof and if you don’t see such a device in your installer’s hand, or you don’t get a report based on the readings from a SunEye, or your installer won’t guarantee the findings in the report… find an installer who will. And please don’t believe the BS that they can work it out from a Google Maps picture of your roof. They can’t. For those of you with shade, you could consider a special design of solar system called panel-level optimisation, which is more tolerant of partial shading. We’ll cover that in Step 5. 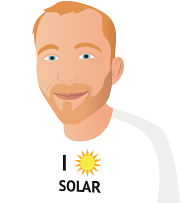 You can now have an informed conversation with a solar installer and salesperson about the solar options for your particular roof.